CYNDI MURRAY PHOTO | Sea Tow has a loaner life vest station at Founders Landing in Southold. Sea Tow has launched its national Life Jacket Loaner Station program for the 2013 summer season. The program allows boaters to borrow life jackets while they’re out on the water, on the condition the vests eventually be returned. The program was made possible by a $20,000 donation from the beverage distributor Clare Rose, Inc., of Yaphank, and American brewing giant Anheuser-Busch, of St. Louis. The Southold-based company, celebrating 30 years in business, also offers free boating safety and information services to the public, including the Sea Tow App for smartphones and Sea Tow’s Automated Radio Check Service. ALYSIA MACAULEY PHOTO | Deb Dowd on the tiller, Alicin Reidy (crew) and Reilly Bergin-Pugh in the the SIYC Ladies Race. She just might be successful. 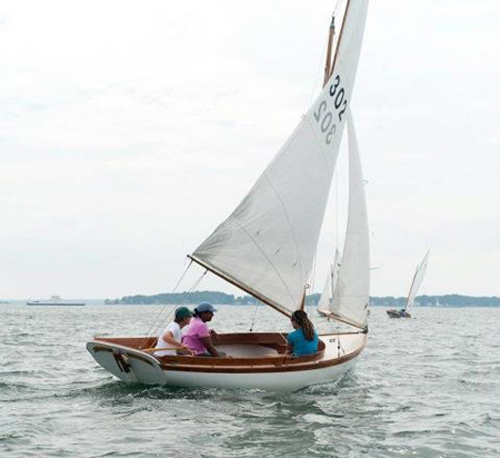 Last Sunday, Dona organized a Ladies’ Race at the Shelter Island Yacht Club, encouraging female members of “all ages and skill levels” to compete using that boat. The Doughdish, a fiberglass replica of the wooden Herreshoff 12 1/2, is a small sloop ideally suited for sailors of all ages. It’s perfect for racing or a pleasure sail. Twenty-eight women and two young girls participated: mothers and daughters sailed together, old friends reconnected and new bonds were formed. The Skippers’ Meeting started promptly at 2:30 p.m. Race Committee Chair Courtney Luddecke along with Race Committee volunteer Jody Thompson used visual aids to clearly explain the “five minute starting sequence.” Thirteen boats were rigged quickly and sailed to the mouth of Dering Harbor to wait for the starting signal. Important on-the-water support was provided by Harry DiOrio, Ed Hydeman, Angus Macauley, Jim Pugh, Steve Schram and Reeves Thompson. Cloudy skies and strong, shifty wind made for an exciting five-legged windward-leeward race. Afterwards, the SIYC provided a celebratory party, attended by family and friends. Jean Brechter, a longtime Yacht Club member and volunteer, did the honors: bestowing awards to skipper and crew up to fifth place. As always, SIYC sailing director Jeff Bresnahan was available for guidance before, during and after the race. Kudos to all the sailors who participated in this special event. Although this race was just the second Ladies’ Race of this decade, the club’s archives include a photo of women racing in 1896! Special thanks to Reilly Bergin-Pugh and Lisa Krekeler, who graciously agreed to be the onboard “safety net” allowing Deb Dowd and Sue Siegelbaum to compete on the tiller as skippers in their first race. Congratulations to all the ladies! *Thanks also to Eliza Pile-Spellman for allowing her boat, Aztec Eagle, to participate.